Back in October I called the North American Car and Truck of the Year (NACTOY) award — an annual prize presented at the Detroit Auto Show and determined by a 50-person jury littered with jurors relevant only for being a juror — a joke for the laughingly obscene choice of the Mini Countryman as a nominee for "Truck of the Year." Last week, the three finalists for both "Truck of the Year" and "Car of the Year" were announced. And guess what? Despite the Mini Countryman not making the final cut — the award's still a complete joke. Here's why. The Ford Focus, Hyundai Elantra and the Volkswagen Passat were announced last week as the three finalists for the 2012 North American Car of the Year. While I might have a problem with the choices on merit, I don't doubt that any of the three could have made that list depending on the subjective viewpoint of the jurors. No, the problem is with the trucks. 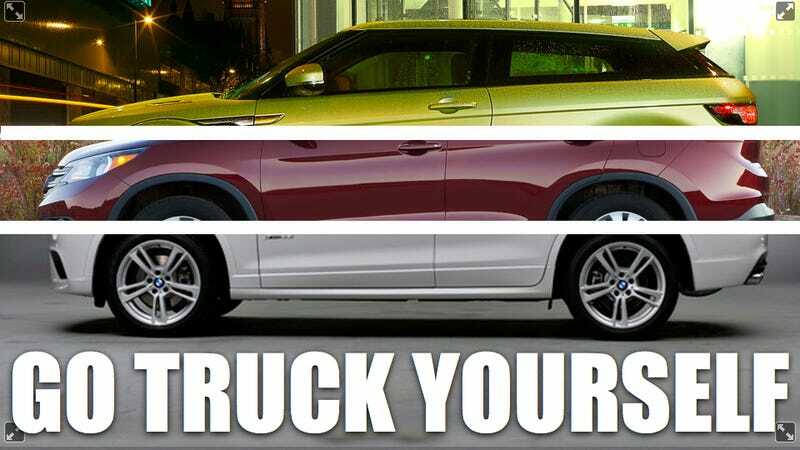 The finalists for the 2012 North American Truck of the Year are the BMW X3, the Honda CR-V and the Land Rover Range Rover Evoque. First of all, none of them are trucks in the traditional sense of the term. There's no open truck bed or a 4' by 8' dedicated cargo space, none have a body-on-frame architecture, and only the X3 has a longitudinal engine layout and the ability to tow 5,000-plus lbs. Remarkably, one of the few jurors on the jury who I respect, completely agrees. In a piece titled "Why the 2012 Truck of the Year will get some pushback," Ed Lapham of Automotive News tries to explain why the choices for "Truck of the Year" will get "a lot of carping." This year there is bound to be a lot of carping about the three finalists for North American Truck of the Year: the BMW X3, Honda CR-V and Range Rover Evoque, none of which is what I consider a real truck. Here's a news flash: That's not our fault because there weren't any new or substantially changed trucks introduced this year. There were just seven vehicles in the truck category, all dandy SUVs or CUVs, but no real trucks. So why the hell is the award committee even bothering to give an award this year if they think there's no "real trucks" that meet the criteria? Better yet, what the hell is the criteria for a truck? Last year's winner was the Ford Explorer, and near as I can tell, considering it's based on the Ford Taurus, I have no idea how it could ever be considered as a truck. Does it get to compete as a legacy? Is the Ford Explorer part of some Detroit auto industry Old Boys' network? Sean P. Holman, the technical editor of Four-Wheeler Magazine, agreed that the three choices the committee came up with for "Truck of the Year" finalists makes no sense. "Frankly, the best idea is to split this into three awards — cars, crossovers and trucks," Holman said. But if we can't this is the better way to recognize the true trucks out there based on capability and durability." Which is funny, considering the most capable and durable trucks made by major automakers — heavy duty pickups like the Ford Super Duty and Chevy Silverado HD — aren't allowed to compete because the award committee considers them to be "commercial vehicles." But the Transit Connect — clearly a commercial vehicle that has a lower chance of being purchased by a consumer than a heavy duty pickup — was not only allowed to compete, but it actually won "Truck of the Year" two years ago. This kind of blatant nonsensical decision-making is what irks me and others who actually have their wits about them. So how could NACTOY change the criteria to recognize true trucks based on, as Holman says, "capability and durability?" One idea we proffered was the establishment of a list of five criteria on what determines a truck. A candidate would then only have to meet, say, three out of five of the criteria. Anything not meeting the three-of-five test would be a car (or a crossover, if the committee had the balls to go through with a third award, instead of pussing out like they did a few years ago). - Has ability to be four-wheel or all-wheel drive. - Has an open truck bed or a 4' by 8' dedicated cargo space. - More than 5,000 lb. towing. As you can see, only the BMW X3 would make it as a truck — and only thanks to its exceptional towing capacity. The other two? They're cars in SUVs clothing. Yup, looks to me like that actually works. Right now, however, whatever criteria the committee does use doesn't seem to make sense. More to the point, if there aren't any good trucks, then just don't give an award, OK? Or else you'll continue to look like a complete joke. Why don't you try out the three-of-five test in the comments for yourself with some other vehicles. Let's try and see if we can't work together to come up with a formula to help solve NACTOY's credibility problem. Because it's clear they can't do it themselves.